"A nice Mexican-inspired shrimp salad that is highly rated and requested, especially during the summer months. Easy to make, and ingredients can be adjusted to your liking. It is great with regular saltines; however, for it to be authentic, place salad on tostadas and top off with diced avocado and a splash of bottled hot sauce for a true experience!" 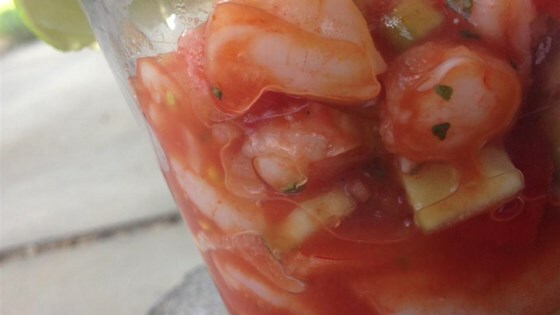 Cut cooked shrimp into thirds and place in a large bowl; add cucumber, onion, and tomatoes. Mix cilantro and lime juice into shrimp mixture. Pour ketchup and tomato juice over salad and mix well; season with salt. Sooooooo good...I will be making this again and again!! !